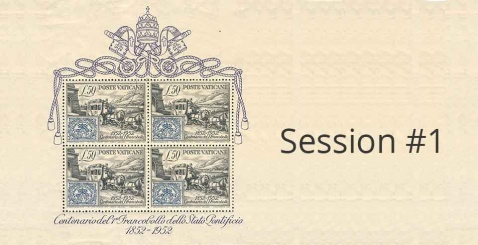 We are pleased to present you the annual autumn stamp auction 2018 of Champagne Auctions which includes 1164 Canadian & worldwide lots. You will find a wonderful specialized selection of stamps Canadian (336 lots), including: a nice selection of classic stamp, mint & used, F to VF with H/NH, some nice collections of Cinderellas or Canadian Special Cancellation & much more. On the World side you can find in single, blocks, sets & specialized collections : Austria (22), Belgium (29), China "PRC" & Formosa, Egypt (11), France (79) including a fine selection of Ceres & Napoleon, a very nice & specialized selection of Germany and States (190), GB (19), Israël (13), Poland (13), Russia (15), Saar (17), Switzerland (18), very nice selection of United States (73), Vatican City (19), Worldwide (58) & much more to see. #1 Afghanistan (1891-1980) mint H/NH & used collection. #2 Africa consignor's balance mint H/NH. #3 Africa & Middle East #1, mint hinged & used collection. #4 Africa & Middle East #2, mint hinged & used collection. #5 Africa & Middle East #3, mint hinged & used collection. #6 African countries - A to Z mint H/NH & used. #7 America & Caribbean (1900/1981) mint hinged & used collection. #8 Andorra (Fr) #C1-C4 mint hinged. #9 Andorra (Fr) #J9-15 mint hinged & used. #10 Andorra (Fr) #J32-41 mint hinged. #11 Andorra (Fr) (1932-1942) mint LH selection. #12 Antigua #8/813 mint NH & used collection. #13 Asia (1876/1960) mint hinged & used selection. #15 Australia #101 VF used. #16 Australia #219-221 mint NH Specimen. #17 Australia (1914-1932) VG/VF mint hinged & used selection. #18 Australian states (1854-1882) VG-F mint no gum & used selection. #19 Austria #1b VF mint hinged. #20 Austria #6b (mint no gum) mint hinged. #21 Austria #8 F-VF mint hinged. #22 Austria #22 VF mint hinged. #23 Austria #25 fine mint hinged. #24 Austria #26 F-VF mint hinged. #25 Austria #31 F-VF mint hinged. #26 Austria #40b F-VF used. #27 Austria #288a,290a-292a mint NH, #289a & 294a mint hinged. #28 Austria #326-339, mint H/NH. #29 Austria #390-2, 405-27 mint hinged. #30 Austria #P1a F-VF used. #31 Austria (1850-1880) F-VF used. #32 Austria (1850-1945) mint H/NH & used collection. #33 Austria (1850-1986) mint H/NH & used collection. #34 Austria (1945-1976) mint H/NH & used collection. #35 Austria #2/1068 used accumulation. #36 Austria #3/1934, B1/326, C6/63, J's, mint & used collection. #37 Austria B.O.B (1894-1921) mint H/NH & used collection. #38 Austria & Bosnia (1900-1955) mint hinged & used collection. #39 Austria : 4 WWII era Postcard & 1 WWI Card. #40 Austria, Office & Occupation (1850-1918) mint H/NH & used.